eInstruction CPS Users Note: If eInstruction Device Manager or eInstruction Tools software is running, it might cause your receiver not to be detectable by ALL In Learning. It's easy to fix -- see this article for the solution. Don't see your clickers mentioned? *Must be fully functional as matching sets and not require special driver software. Unfortunately, ALL In Learning support isn't able to help with clickers from other companies that are not functioning. In order to use clickers or Web Clicker in ALL In Learning, you'll need an account and to have at least one class set up. See this article for the steps if needed. You will be prompted to install the plugin if you try to do a clicker activity and it isn't already installed or if there is an update. Just follow the onscreen instructions. The plugin enables your browser to work with clickers and can usually be installed in seconds by a teacher without admin rights. The Easiest: Use Clickers "On the Fly"
Research shows that frequently checking for understanding and re-teaching is the most effective and affordable strategy to produce academic gains, in a comparison of the 22 leading educational reform strategies. Classes that do this consistently outperform classes that don't. On-the-Fly questions are really easy to get into and the window will sit on top of other applications on your screen. So they are the best way to randomly check for comprehension as you teach, by asking verbal questions, writing them on a whiteboard, projecting questions from a web page, projecting a doc cam view of a printed question, etc. On the Home tab, click "Use ALL In Response 'On the Fly.'" Or, in the Lessons/Assessments tab, click Teacher Tools > AIR "On the Fly." Or, click the "AIR 'On the Fly'" button located within our Doc Cam feature. Enter a name in the Report Name Field, and click the name of the class you want to use. The On-the-Fly Controls window will open. Click "Start Question." When you are through collecting responses for this question, click End Question. The Charting window will open. Click an answer choice in the "Set Correct" section. You'll see the correct answer indicated in green on the graph. Students love seeing the class answer distribution - especially when you are checking if they understand a lesson you are teaching. This gets them invested and interested in understanding - it becomes a game for them and valuable intel for you! You can choose different types of charts at the top of the window for variety. Click "Close" when finished with this window. Click "Start Question" again to ask more questions and repeat the above steps. When you are finished with your session, click "Close Session." An alert will pop up asking if you're sure - clicking "OK" will trigger a report to be generated in your Reports Tab with all the questions you asked during the session in order. NOTE: You can attach standards to the report very easily later to track standards mastery and coverage, by going to Reports>Actions>Edit Key & Standards! It's easy in ALL In Learning to display questions on screen for use with clickers. This is ideal for testing with clickers or for posing a question in the middle of a slideshow. And, lessons in ALL In Learning can be used as shared assessments, with great aggregated reporting. Assessing students this way is green, it's fast, it gives you instant feedback, and it saves hours of grading time. Log into your ALL In Learning account. Click Lessons/Assessments > My Lessons. Next to your lesson, click Activate > Use ALL In Response > Teacher Paced. The lesson will open in "Presentation" mode for display to students. The "Slideshow Control" window will be open on top by default, which is meant to be moved to another monitor out of view of students for use as an optional way to control the presentation, see response charts, and refer to any presentation notes you wrote yourself. You can simply close or minimize it if you do not want to use it - we'll close it for the remainder of the instructions. Before proceeding, you may want click "Options," and choose whether to show your class the correct answer or their cumulative score after each question. Click "Close" when you've got the settings you want. Now, click "Start Question," and tell your students to start responding. When students are finished responding, click "End Question." Based on the options you chose, a chart may pop up showing your class information about how they responded. After discussing the chart with your class, click Close on that charting window to proceed. To advance to the next question, use your keyboard's spacebar or right-arrow key, click anywhere on the slide, or use the controls in the Slideshow Control window, and repeat steps 7 and 8 above. When finished with your test, click "Close Session." An alert will pop up asking if you're sure - clicking "OK" will trigger a report to be generated in your Reports Tab with the same title as the lesson/assessment. Student-paced clickers allow students to use a hard copy of a test and answer questions with their clickers t their own pace. For the teacher, this option allows for immediate grading and data, without having to worry about scanning bubble sheets. Log into your ALL In Learning Account, click on the Lessons / Assessments tab, choose My Lessons, and then click Activate > Use ALL In Learning Response > Student Paced. Unlike Teacher Paced, the questions will not be projected in front of the class. To use Student Paced, you'll need to print off the assessment, or have some way that the students can individually access the questions. To print off the assessment from ALL In Learning, click on Actions>Print Questions or Actions>Export to Word, then print. Click on the class for which you would like to activate the assessment. You and your students will need to be familiar with the color-coding for Student Paced mode. The top number is the device number which is assigned to a specific student. The bottom number is the question number the student is working on. When a student has given an answer, the bottom number will turn blue, and the student must select the same answer again to confirm. Once confirmed, the bottom number will flash "green," and the student is ready for the next question. If the bottom number flashes red, the student is trying to give an answer that is out of range. For example, the question allows for answer choice A,B,C and the student is trying to select "E."
The bottom number will flash yellow to tell the student that his or her answer has been successfully changed. The student will still need to select the answer again to get the green "confirmation" in order to proceed to the next question. The student cannot return to a previous question. When both the top and bottom numbers are blue, the student has answered all the questions. You may hit "End Session" at any time, and a report from the student responses is instantly available to you on your Reports tab. Activating a clicker session using Student Practice Mode allows for students to work through problems and questions at their own pace. Until the student clicks on the correct answer, the question won't proceed, which facilitates the student in mastering and learning the content on their own. Once you have created an assessment, follow the steps below to activate a Student Practice Mode session. On your Lessons / Assessments tab, for the Lesson you wish to activate with Student Practice Mode, choose Actions > Use ALL In Response > Student Practice Mode. Click on the Class for which you would like to activate the Student Practice Session. A chart of how Student Practice Session works will display. You will have to close this chart before proceeding with Student Practice Session. It is important for the student to remember that the top number is their device number and the bottom number the question number, and that the question will not move forward until a correct answer is received. If the student clicks the same answer twice, the question number will turn green, if they click an answer option that is out of range (for example: clicking on "E" when the question only has options A-C) it will flash red, and a yellow flash means that the student has clicked on one option but then chose another. Green, Red flash and Yellow flash tell the student that their answer input is being received, but until the question has moved forward, they have not selected the correct one. When both blocks are blue, the student has completed the entire assessment. A Report is made once the Student Practice Session is ended. This report only records the first answer the student gave for each question. Although it is a practice session, scores are kept for the first answer given so you can check on your student mastery. 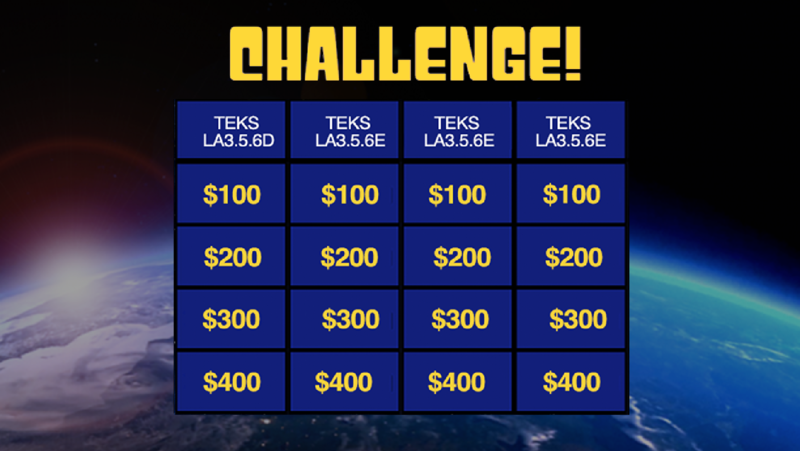 Challenge Boards are pre-built Jeopardy-like games with standards-linked questions meant to be displayed to your class and answered with Clickers or by students using our Web Clicker feature with their phone, tablet, Chromebook, or computer. Challenge boards can be used with a "teams" roster (teams share a device) or with each student responding on their own device. They can be used for fun engagement or for serious review and evaluation. All responses are recorded in your reports tab for analysis and intervention. Having trouble with your clickers? Click here for help! Web Clicker: Student Response with Chromebooks, Tablets, and Other Devices. Error Message Saying "We cannot find any attached receivers ..."